Many thanks to Chris Walkerow at Periodic Products and Fred Schweer at Pool Rx for incredible help with our pool. We’ve been dealing with gray/brown discoloration on the bottom of this pool in southwestern Pennsylvania for several years without success. Finally last fall, I reached out to Pool Rx whose sanitizing product we use. Fred worked with us and directed us toward C U Lator to deal with copper removal. In talking with Chris about the issue, he recommended that we use their Iron Bacteria Eliminator product to address the discoloration. So after dumping and refilling the pool to get rid of the very high chlorine stabilizer that had built up from past efforts, we followed Chris and Fred’s guidance to the letter. Nothing went in the pool this season without their approval. We couldn’t get the C U Lator products locally so we had them shipped up from Chris in Florida. Even liquid chlorine was very difficult to source locally: “Nobody uses that, use tablets or granular” is what we kept hearing. But we insisted on what these two chemists recommended. We HIGHLY recommend Chris and Fred for their outstanding ability to deal with pool chemistry issues. Apparently, a combination of iron bacteria in our fill water combined with clay soil, a high water table, and direct sunlight resulted in this persistent discoloration. Chris was the first to figure out a solution. Attached are before and after pictures. A HUGE thank you to Chris and Fred!!! 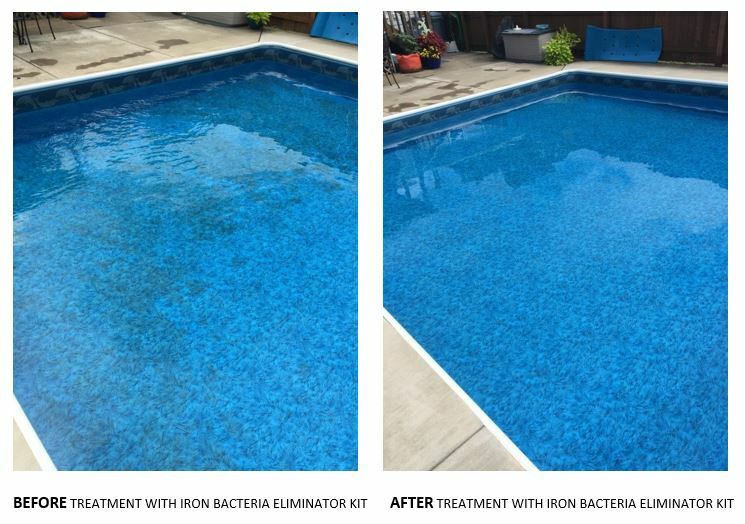 This entry was posted in Iron Bacteria Eliminator Kit and tagged culator, iron bacteria, iron bacteria eliminator kit, iron stains, metal eliminator, Metal remover, metal stains, metal stains in pool, pool stains, swimming pool stains. Bookmark the permalink.